Spent 4 days in Bozeman with beautiful weather, but decided we should keep on track with our trek to Connie’s 50th HS reunion in Cheyenne. 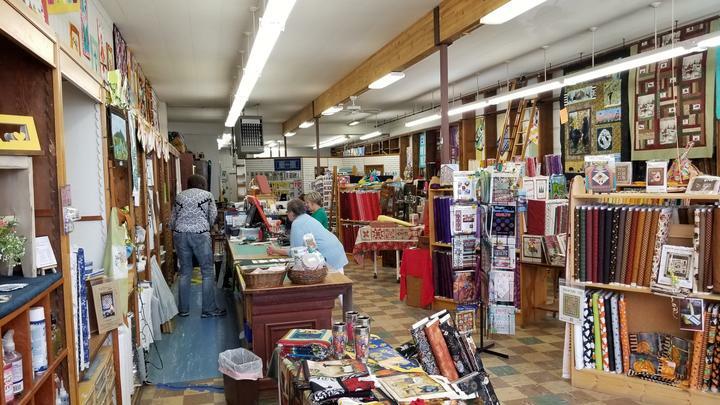 We got on our way from Bozeman to Garryowen, on Wednesday July 25, but had to make a quick quilt store stop at Big Timber. 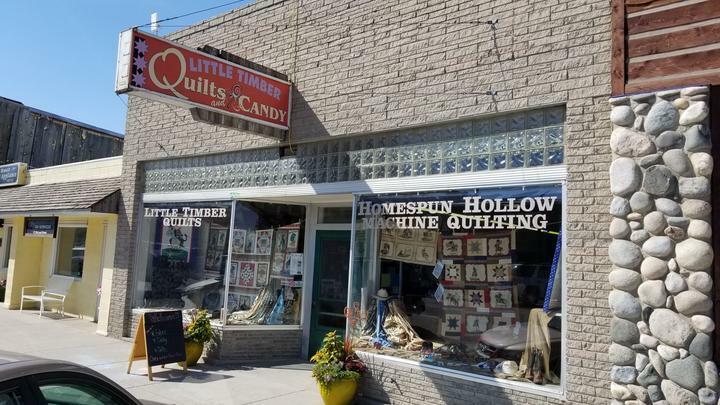 A cute little shop called Little Timber. Wouldn’t you know, Connie found a piece of fabric “just right” for one of her projects. Yay! 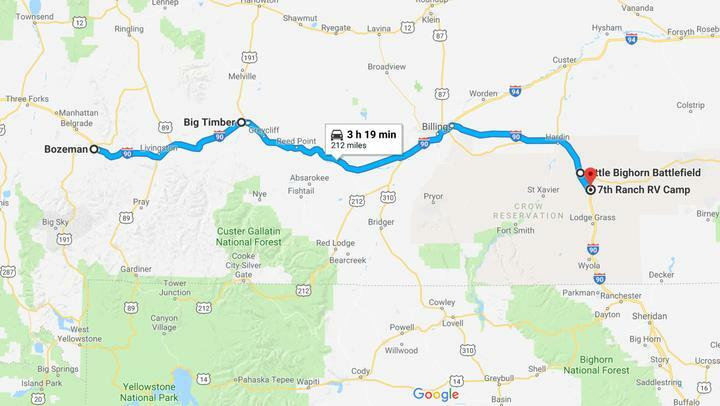 We found Big Timber to be delightfully welcoming with a small town footprint. 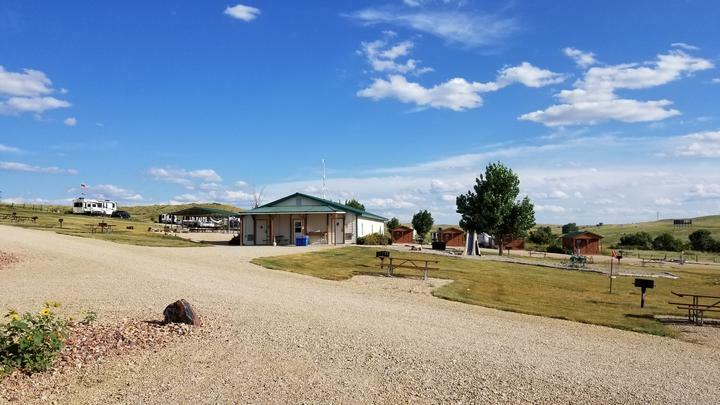 Arrived around around 2:30pm, parked and setup at 7th Ranch RV Camp, just south of Garryowen and the Little Bighorn National Park. 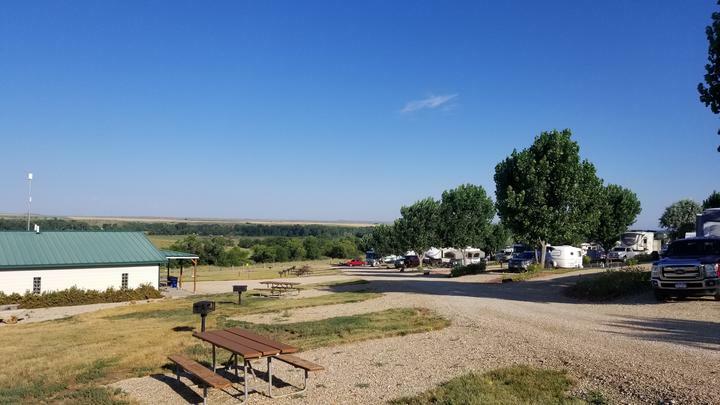 The first picture here looks north toward the battlefield and the Little Bighorn river. A delightful location with full hookups. They even offered us a free ice cream treat when we checked in. We didn’t want to insult them, so we accepted. 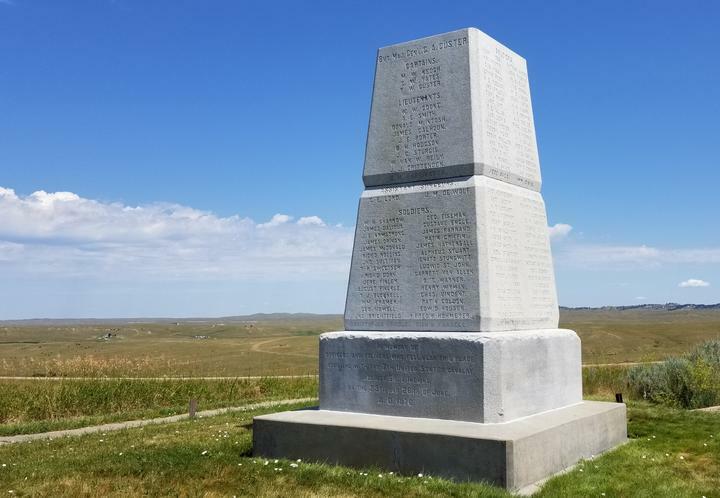 Thursday, we drove the short 7 miles from our site to the Little Bighorn Battlefield National Monument (Custer’s Last Stand) arriving soon after they opened the gates. Free to old folks (62) with the America the Beautiful National Park Senior Pass. They are $80 now, but were only $10 when we got ours. Sorry youngsters. 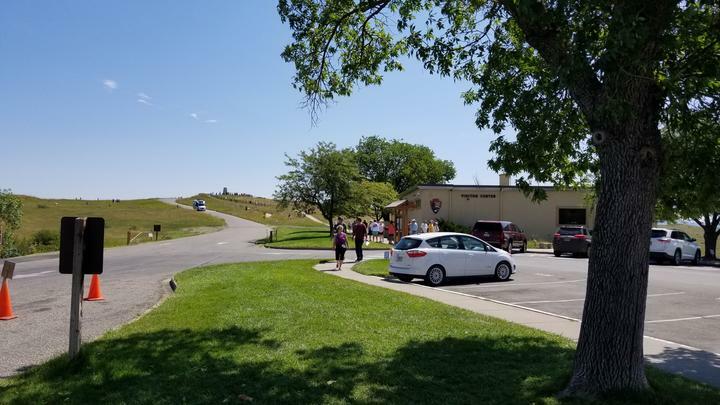 Next to the visitor center is Custer National Cemetery. 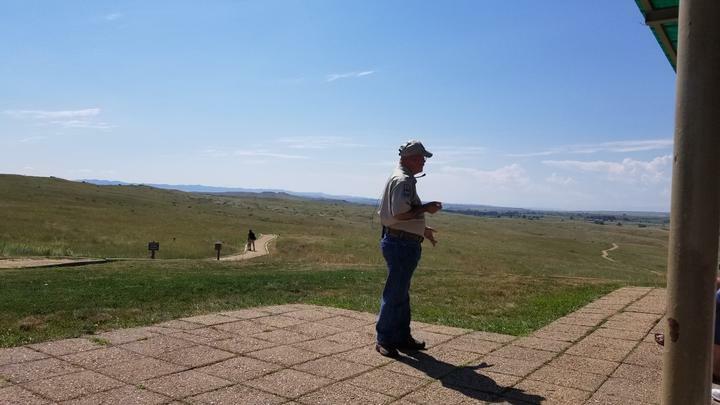 Custer’s Last Stand site is on the hill just beyond the visitor center. We watched a very informative 45 minute video in the visitor center, then caught the ranger talk on the south side overlook. The Ranger, actually a volunteer, dramatically spoke for around 30 minutes about the battle field and a step by step review of what took place that June 25, 1876, along with the events that led up to it, as well as afterward. After the ranger talk, we walked the Deep Ravine pathway from the visitor center toward the Little Bighorn river. Much of the battle that the indians call “The battle of Greasy Grass” took place in this area, as well as some of the surrounding area. The 249 marble stones mark the place where each soldier originally died and were buried in shallow graves. Our nations only battlefield where markers are found where soldiers fell. 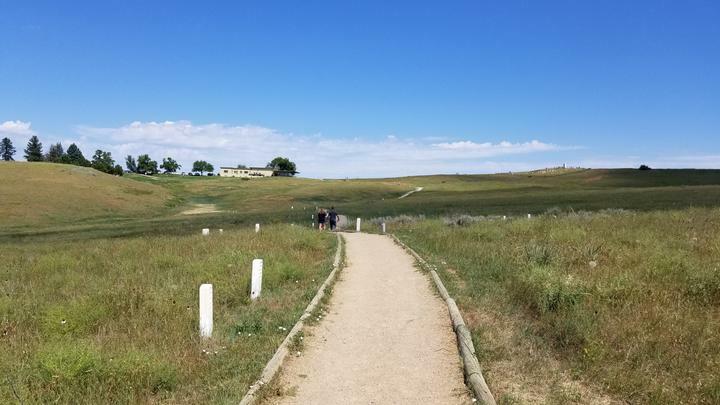 In 1999, with input from stories handed down from Lakota and Cheyenne families, the park service began placing red granite markers where the 60 plus indians fell. A difficult task since their bodies were taken away by the tribes after the battle. Last Stand Hill Monument has the remains of about 220 soldiers buried around the base of the memorial. In 1877 the remains of 11 officers and 2 civilians were moved to various cemeteries throughout the country. Lt Colonel Custer was buried at West Point. Custer had been a general during the civil war, but assumed his regular army rank after the war. In 1881, the other soldiers were relocated from their original grave where they fell and re-interned in a single grave below the monument. We opted to take the Absaalooke Tour bus for further explanation of the battle. 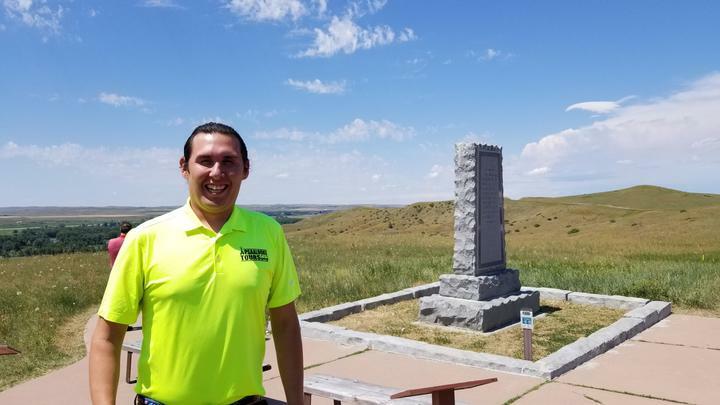 A young Crow Indian was our narrator as we traveled along the battlefield road to the Reno-Benteen Battlefield Monument. In June 1876 there were an estimated 7000 Sitting Bull led Lakota, Cheyenne, and some Arapaho gathered in their village on the Little Big Horn River, 1500-2000 were warriors. By order of President US Grant, the 7th Calvary was determined to push the indians back to their reservation. 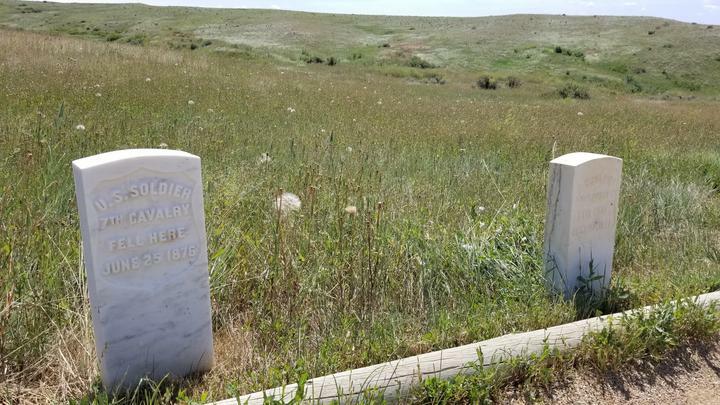 Custer’s men all perished by the warriors determined to live as they had before, but battalions led by Major Reno and Captain Benteen had gathered together after initial fighting and retreated to a location along Sharpshooter Ridge. They conducted the shallow grave burials after the battle. We had passed the Little Big Horn National Monument many times as we drove by on I-90, but glad we stopped this time. An incredible history and site to see. Plan to stop if in the area.